For decades, one's ability to utter the phrase "It has leather seats" was a defining factor in whether or not other people thought your car was nice. The smell, the feel...even the animal from whence it came. All these factors contributed to the allure and mystique of leather seats. The thing is, though, you should never get leather seats in your car. While animal rights activists and environmentalists have their own reasons to tell you to go for cloth, I'm not going there in this piece because it's irrelevant: all ideological debate aside, leather seats don't make a whole lot of sense in the majority of cars. And I'm going to tell you why. Quick history lesson: because tanned hides (i.e. new leathers) smell pretty awful, leather goods are soaked in perfume. This has been going on for hundreds of years—in fact, the “English leather” smell was created for King George III’s gloves. The simple fact is that when you opt for leather seats, what you're actually getting are seats with leather inserts. The backs of the seats, the sides, and sometimes even the headrests aren't leather in most cars. Why do you think some companies offer "extended leather" options at a significantly higher cost? 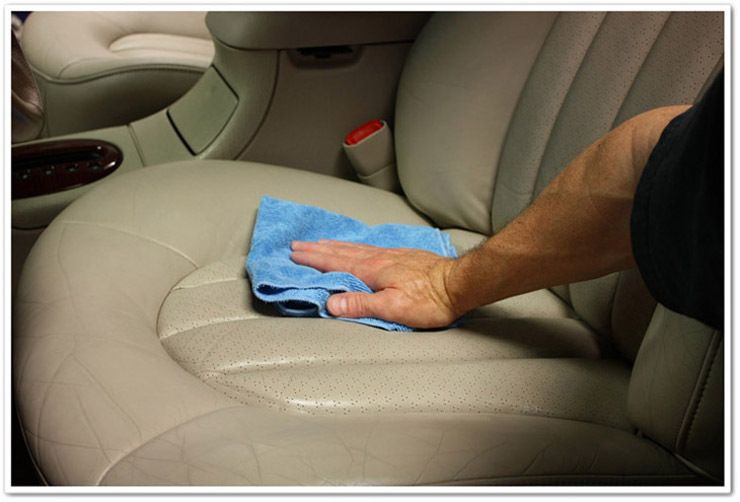 To properly take care of leather, you need to clean and condition your seats several times a year. Not just every so often. The very best leathers, when properly maintained, develop a classy patina. Everything else—including the majority of car leathers—will age about as gracefully as Mickey Rourke. 5. Leather’s pretty heavy If you have a performance car, you want it to be as light as possible. Wrapping everything up in leather isn't exactly the best way to do that. McLaren once famously saved over ten pounds simply by shaving a layer off the leather. Take a close look at your leather seats. If you don’t see much natural grain, it generally means that the cow was so scarred from things like barbed wire fences and bug bites that the tanner had to sand everything down to make it even. You know how you have to adjust yourself in your seat every time you take a turn too quickly or have to stop short on a red light? Fabric is grippier, so you'll slide much less. Climbing into your car with leather seats on a hot summer day, when you can see heat radiating from the pavement, is akin to sitting in a vat of hot coffee. Do the same on a frigid winter morning and you automatically qualify for the Polar Bear Club. If you’re in a Bentley or Rolls-Royce, then yes, of course the seats are heaven on Earth. They're made with some of the softest and best prepared hides on the planet for God's sake. If, however, you’re in something down around the $30,000-$40,000 range, more often than not, the leather is stiff and not nearly as comfy as the cloth option. Go to a dealership and sit in the same car with and without leather. You’ll understand. Aaron Miller is the Rides editor for Supercompressor, and can be found on Twitter. He swore off leather years ago in pursuit of better options.